In a luxury suite 32 stories above the Las Vegas Strip, Ian Paul is explaining why virtual reality is so important to his company. Facing aggressive competition from free, ad-supported rivals, he believes VR can help him win over customers willing to pay a premium for an immersive, engaging experience. Paul could be an executive with the New York Times Co . , Fox or ESPN, all of which were at this year’s Consumer Electronics Show (CES) to talk about how VR is going to change their respective businesses. But he isn’t. Ian Paul is a pornographer. Welcome to the real world of virtual reality. At the same time Paul was explaining why his target customers don’t need a 360-degree field of view (“They’re primarily focused on what’s going on in front of them”), movie studio Fox was hosting a private party for the launch of “The Martian VR Experience” an elevator ride away. According to a report issued by SuperData Research on the eve of CES, consumer VR will be a $5.1 billion industry this year, up from just $660 million in 2015. Though it might seem like an overnight sensation, it has taken VR decades to reach this point. In the 1960s, pioneering computer scientist Ivan Sutherland created one of the first head-mounted displays—using tiny cathode ray tubes placed in front of each eye—though it was never commercialized. By the early 1980s, as LCD panels and personal computers began making their way into the marketplace, Jaron Lanier and Thomas Zimmerman, two veterans of gaming company Atari, founded pioneering VR firm VPL Research. There, they began producing the EyePhone, a VR headset. They also invented the Data Glove, a version of which—Mattel’s Power Glove—allowed users of early Nintendo gaming consoles to control (or attempt to control) their games through hand movements. The dreadlocked Lanier, often credited with coining the term “virtual reality,” became the industry’s poster boy, attaining rock star-like status among the technology’s early fans. There was just one problem. “The hardware just wasn’t inexpensive enough,” says Zimmerman. Prices for VPL’s EyePhone started at about $10,000 in 1989, while other VR systems went for as much as $200,000. There were other early attempts to create consumer VR products: Nintendo’s Virtual Boy headset was a notable flop in the mid-’90s. But for close to two decades, VR was largely confined to research labs and high-end military or industrial applications. Consumer VR seemed to be something that, although tantalizingly close, was destined, like flying cars and jet packs, to remain part of a future imagined in the past. The technology finally caught up with the vision for VR, thanks to advances like desktop computers that were more powerful than the supercomputers of the Lanier era, and ubiquitous smartphones with high-resolution displays. 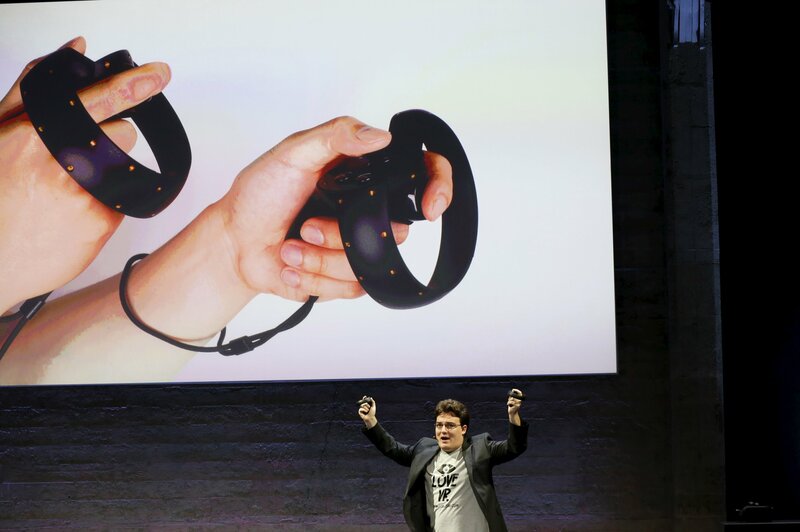 Then along came Palmer Luckey, a college student and hardware engineering prodigy. In 2012, he launched a Kickstarter campaign to fund development of his headsets. Within four hours, he had raised $250,000. Within days, the campaign brought in $2.4 million from developers eager to purchase a prototype of Luckey’s Rift headset. The company—now called Oculus VR—would eventually sell over 175,000 of its prototypes. At CES this year, it often seemed as if billions of people—and millions of companies—were interested in the future of VR. Oculus, which will be first-to-market with a high-end consumer VR system when it starts shipping the $600 Rift in March, had a giant booth anchoring the show’s Virtual Reality and Gaming pavilion, where show attendees waited for two hours or longer to get a demonstration. 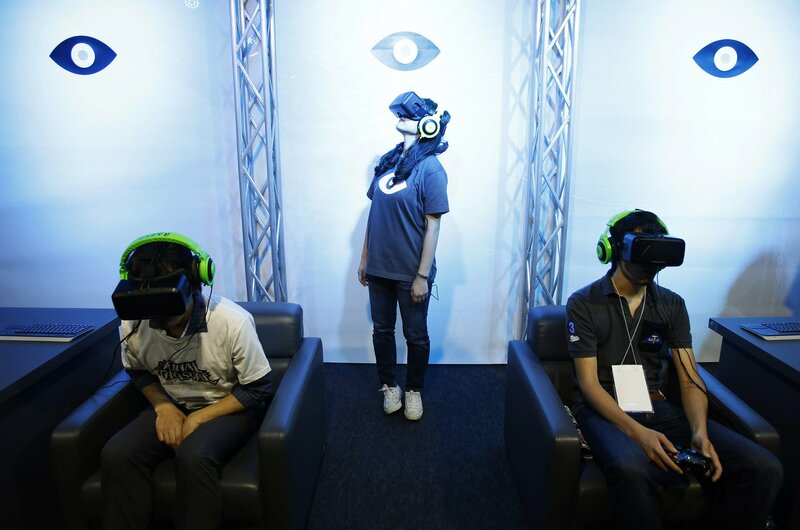 Meanwhile, Sony, HTC and Samsung all demo’d their headsets, and exhibitors sharing their latest VR apps ranged from Dassault Systèmes (a multibillion-dollar French software company) to the Syfy cable channel to NASA. The latter showed off its own Mars-themed VR experience, which ran on the free Google Cardboard platform. One reason VR is finally poised for success is its ability to turn even jaded entertainment or electronics professionals into gushing fanboys. “If a developer says they don’t have time for a meeting, we send them a box,” says Jason Rubin, who heads Oculus’s game development studio. “Then I get a call back: ‘Oh my God. We have to talk.’” At the launch party for “The Martian VR Experience,” Hollywood execs carefully placed Rift headsets on top of their elegant coiffures and emerged five minutes later begging for more. The director of the project, Robert Stromberg, gave up a successful Hollywood career—he’s an Oscar-winning visual effects artist and director of the hit film Maleficent —to gamble on the future of VR. 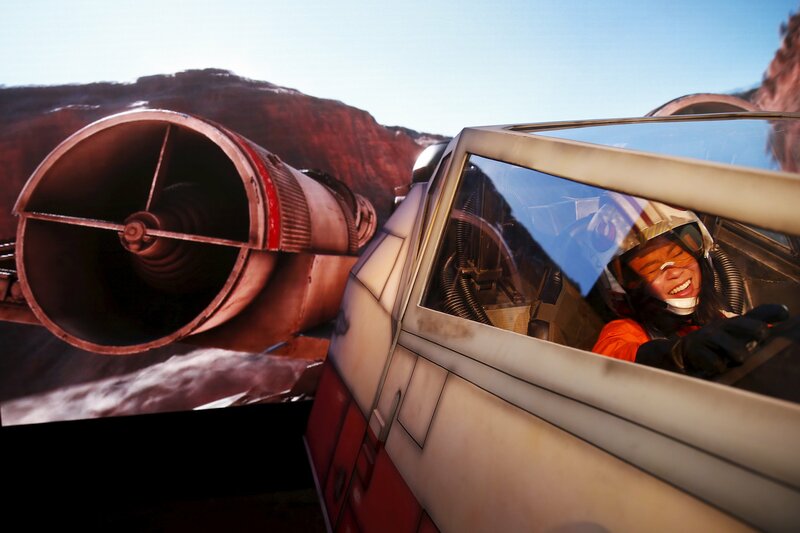 Fox, which produced “The Martian VR Experience” with Stromberg, is equally bullish. “We’re taking you inside the world of an astronaut, where you forget you’re even wearing something on your face,” says Ted Schilowitz, a Fox futurist (yes, that’s his title). Fox wasn’t the only major media company at CES. The New York Times Co., which last year sent 1.2 million free Google Cardboard VR viewers to subscribers, showed up to declare that, on top of the nine VR films the company produced last year, it now plans to roll out as many as two new VR videos each month. About $3.5 billion of the $5.1 billion revenue SuperData predicts for VR in 2016 is tied almost exclusively to gaming. The company expects 5.4 million PC-based VR headsets to ship in 2016, along with 1.3 million of Sony’s PlayStation VR models. Mobile gaming will also play a big role in the adoption of VR, as consumers pick up affordable, smartphone-powered VR devices like Samsung’s Gear VR and Google Cardboard; SuperData expects 42 million mobile VR headsets to ship this year. At CES, the importance of gaming to the current VR market was never in question. From Sony to Oculus to HTC, most of the product demonstrations were game-based. Sony’s London Heist game positions you as a passenger in a getaway car, and you have to shoot at assailants eager to steal your loot. Oculus’s shooter Bullet Train lets you slow down time and, Matrix- style, grab bullets out of the air and hurl them at your attackers. “Toybox” environment, in which you share a virtual space with another person (who, in this case, was in the next room but could easily be on the other side of the world) and play table tennis and tetherball, toss blocks around and shoot each other with a shrink ray. It’s a tantalizing taste of the potential for VR as a fully interactive experience involving other human beings, not just artificial environments. Despite all of the enthusiasm, these are still early days for consumer VR. “We’re in the flip-phone era when it comes to VR,” says Nick DiCarlo, Samsung’s head of VR. “It will take a while for VR to reach the mass market,” says Oculus’s Rubin. And right now, the best new VR products are not priced for the masses. At $600, the Rift is not an impulse purchase, especially when a PC with the horsepower to use it will run at least another $1,000. The HTC Vive, when it’s released later this year, may sell for more than the Rift, while Sony’s PlayStation VR is expected to sell for at least $400, more than a PlayStation 4 gaming console. Then there’s the question of how large groups of consumers will take to VR. “I wonder about fatigue,” says Zimmerman, who pointed out that one reason early VR systems failed to take off was the fact that the displays couldn’t keep up with head movement, meaning what you saw on the screen lagged behind what you felt you should see, resulting in something akin to seasickness. Although current systems have largely addressed that problem, it’s one that Steve Koenig, director of industry analysis at the Consumer Technology Association, agrees might not be completely solved. “How are people in the mass market going to react? We’ll get feedback and learn from them,” he says. Then again, today’s VR headsets may just be a transitional technology, as we advance toward immersive environments akin to Star Trek ’s holodeck. Those advancements may well provide what VR pioneer Sutherland envisioned when he set about creating his early head-mounted devices.